Wilhelm Friedrich Zachow (1663-1712) is one of those composers who never became known to the great public because of the attention for Bach, Handel and Vivaldi. Onno Verschoor (Accademia Amsterdam) and Ludger Remy explore the musial archives and come with extremely interesting examples of his Church Music, that form a perfect link between Buxtehude and Bach. The project will lead to many first recordings. 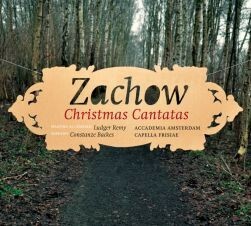 The Quintone recording ‘Christmas Cantatas’ is the first one.